As countries become ever more interconnected and globalized, English proficiency becomes a necessity if a nation and its people are to succeed on the global stage. Therefore early English education is a must, according to the chief of the Daejeon Metropolitan Office of Education. “The merit of our country, which has a small territory and is short of resources, is Koreans’ diligence and education fervor. Early English education will be a means to solidify Koreans’ standing in the global market,” DMOE chief Seol Dong-ho said in an interview with The Korea Herald. The key focus of English education in Daejeon is to have students “acquire” practical English communication skills rather than “study” the language, he said. “To accomplish this policy, the DMOE plans to nurture elite teachers, use native speakers and increase partnerships with foreign schools,” he said, adding that the priority was to expose students to an English-speaking environment. The DMOE will conduct training courses for local teachers and strengthen the certification process to ensure that teachers can teach English in English, he said. Students would get more chances to interact with native speakers and have more reading and discussion sessions in English, he added. 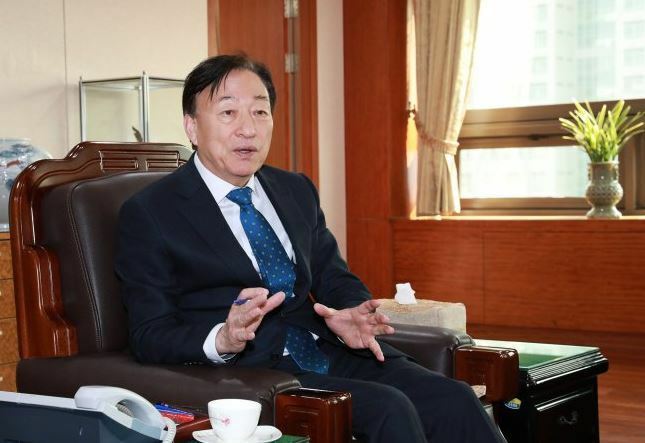 “We will accomplish the English education policy with the aim of helping students improve practical communication-centered English skills so that they can live in the era of globalization more happily and confidently,” he said. Seol spent over 40 years as an educator, first as an elementary school teacher and eventually as president of Hanbat National University. Since he was elected Daejeon education chief in 2014, he has sought to transform the city’s educational system so that it emphasizes creativity. One of his signature projects is the EDU-Bridge project, a model that links education at elementary, middle and high schools to help students discover their talents, receive the education they need and ultimately use those talents in the workplace.